Utagawa Hiroshige (1797-1858) was one of the great masters of the Japanese landscape print. The print series that established his reputation in the early 1830s was the Fifty-three Stages of the Tōkaidō Road. This series depicts scenes along the Tōkaidō, the major highway that linked the cities of Edo and Kyoto. 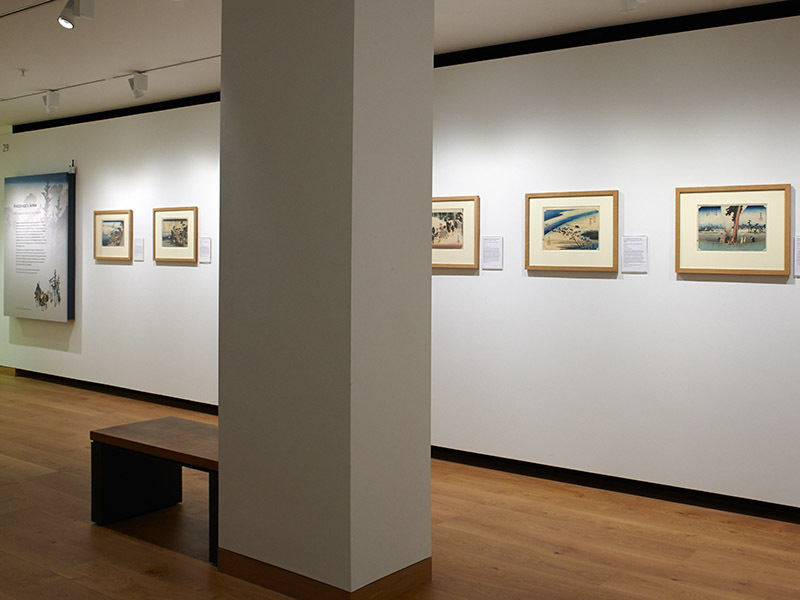 Hiroshige balanced striking landscape views with detailed, often humorous depictions of travellers and their encounters with local customs and various weather conditions. 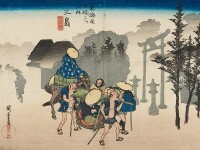 The series was so successful that Hiroshige went on to produce several more sets of views along the road. The landscape was a new subject for Japanese woodblock prints in the early 1800s. Until this time most prints depicted Kabuki actors and courtesans. Hiroshige used a newly available Western pigment known as Prussian blue to depict sky and water. This brilliant blue was especially effective when applied using a printing technique known as bokashi, which allowed subtle colour gradation. 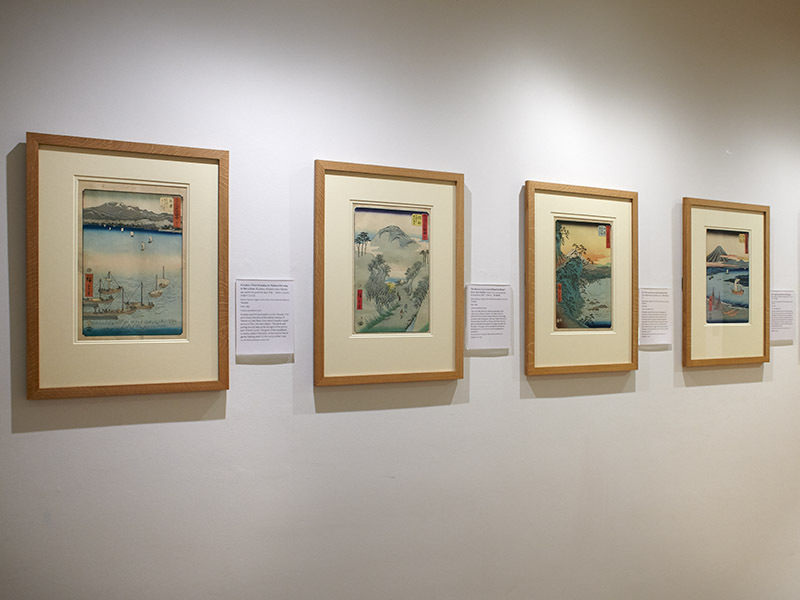 Eastern Art Paintings Gallery - Hiroshige's Japan exhibition detail. 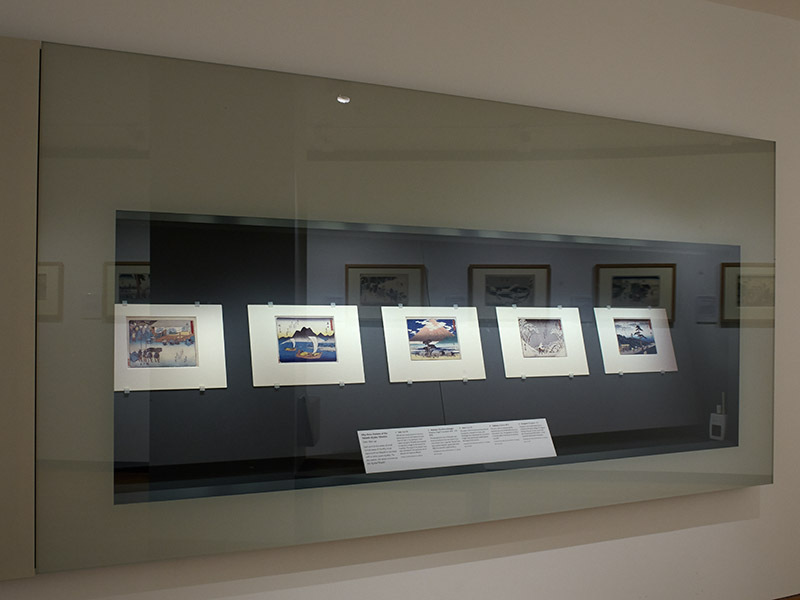 Eastern Art Paintings Gallery - Hiroshige's Japan vitrine case. Eastern Art Paintings Gallery - Hiroshige's Japan exhibition detail.